Are you struggling with hard water? Hard water is a common issue, regardless of whether you have city water or a private well. Typically, when your water is hard, you will see mineral deposits on dishes and glassware, calcium scale on plumbing fixtures and soap residue on shower walls and doors. Hard water can also become costly. Scale formation in hot water heaters, dishwashers and coffee makers add to repair and replacement costs. Our water softeners will get rid of your hard water problems for good. We install, service and repair water softeners and conditioners from Punta Gorda to Venice FL. Click here to schedule your free water test. High performance water conditioner, metered for greater efficiency. Stingy with salt and water! 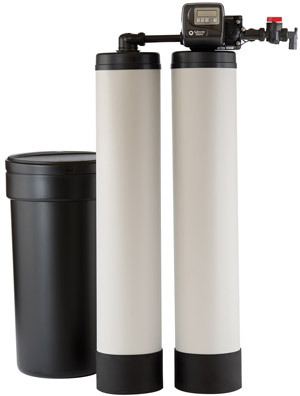 Systems come with 8% crossed-linked water softener resin, made in USA. Gravel underbedding for even flow distribution. By-pass valve included, to isolate the system if needed. 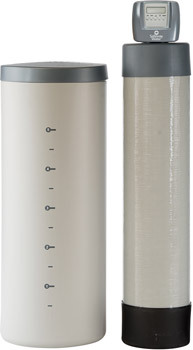 Premium series water softeners feature the Safeway Water proprietary metered control valve and a 10 year limited warranty. Components are made and systems are assembled in the USA. Ten year limited warranty – complete system! Looking for the most effective water conditioner money can buy? Look no further than our twin tank models, providing soft, conditioned water without interruption, 24 hours per day! Living between Punta Gorda and South Sarasota (up to exit 205)? Get a no obligation water quality test from a trained water treatment professional. It’s absolutely FREE.